Take inspiration from the past with vintage style lighting in your home. Vintage lighting is the perfect way to add a touch of charm and character to your decor. From ornate Victorian chandeliers to funky sixties style lamps, there is a vintage style to suit every home. 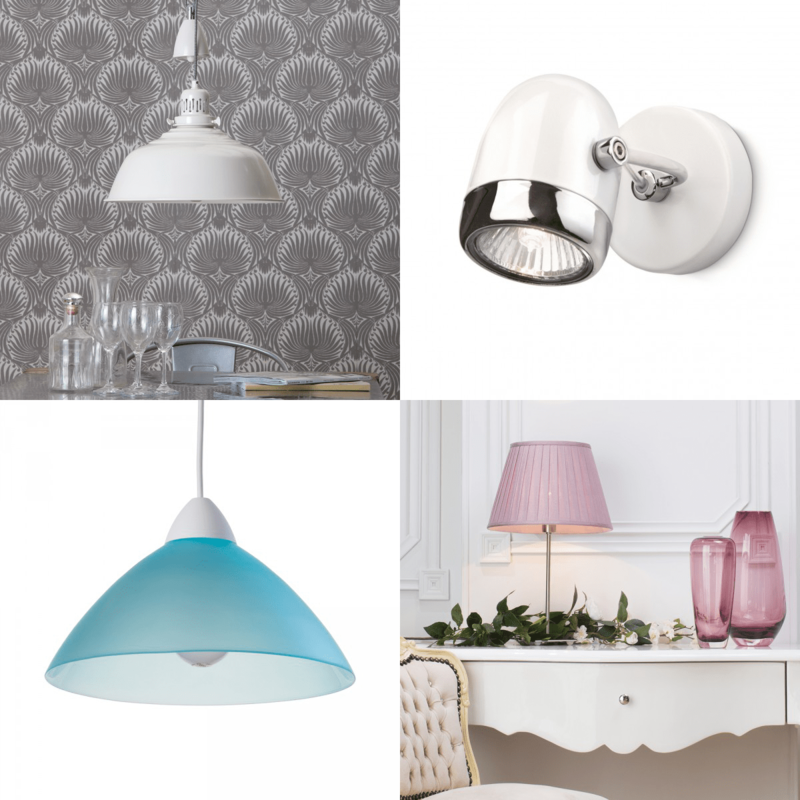 Why not recreate your favourite look from the past with retro light fittings inspired by different eras? With our guide to vintage style lighting, we show you how to achieve a retro look in your home. 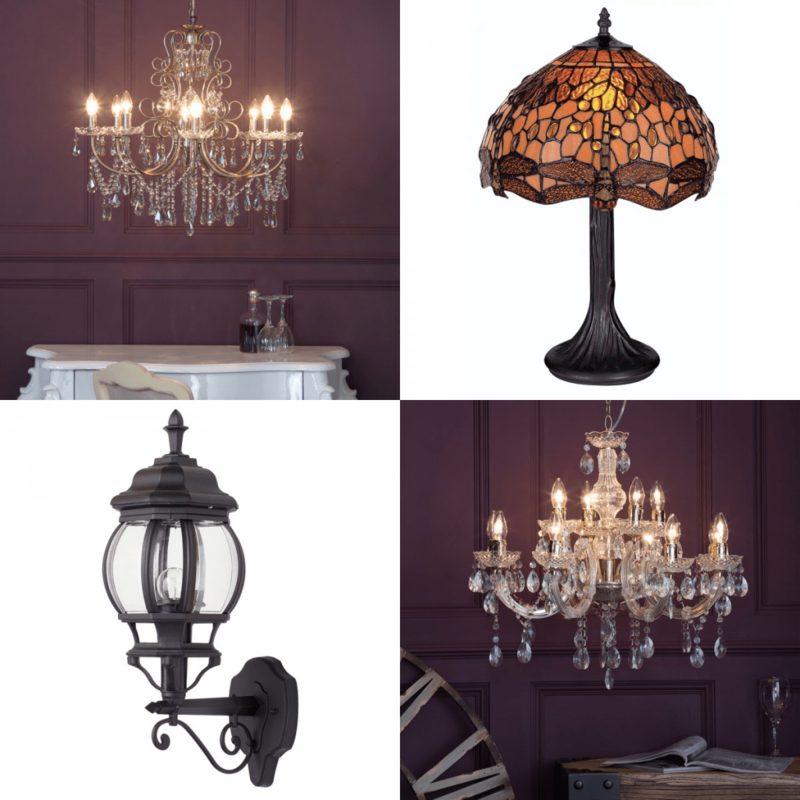 If you’re looking for a decorative vintage look, Victorian style lighting is a perfect choice. This era of design took inspiration from many elements, including nature, gothic revival and designs from around the world and is characterised by ornate design details and elegant shapes. The era was synonymous with extravagance, decoration and opulent materials. Victorian style is traditional but can add a touch of romance and beauty to a modern interior. Victorian style decor will give your home a luxurious and comfortable feel. To light your home, choose period style chandeliers draped in crystal effect beading and drops. For this look, the more ornate and swirling details, the better. The Madonna 12 light chandelier features elegant curved arms and crystal effect beads in an antique brass finish for a beautifully decorative look. For a more modern take on Victorian style, the Marie Therese chandelier is crafted from black acrylic to create a striking look. Elaborate damask print fabrics and wallpaper were a popular choice in the Victorian era. Our easy fit Damask shade and matching Damask table lamp are the perfect way to add a subtle touch of Victorian inspired design to your home. Team your Victorian style lighting with rich fabrics, patterned wall papers and strong colours to recreate the Victorian look. Moving on from the Victorian period, the Art Deco era of the 1920’s was another inspiring time for home decor. This fashionable era was all about glitz and glamour. Often referred to as the roaring twenties, it was a golden age of wealth, parties and style. Fashion and interior design was glamorous and elegant, inspired by exotic locations. The style often featured geometric shapes and lavish decoration. 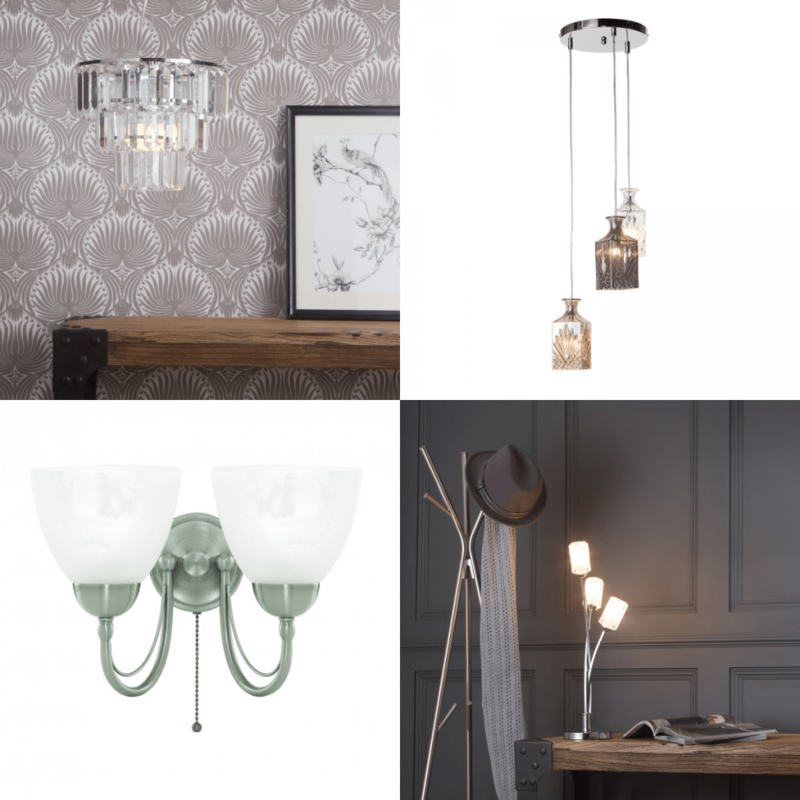 To get the 1920’s look, choose elegant light fittings that feature glass detailing and beading as well as geometric shapes inspired by the art deco movement. The Istanbul easy fit pendant shade features a crystal effect tiered bar design for a glamorous look. In terms of materials, shiny fabrics such as polished chrome, mirrors and glass were a popular choice in the twenties. Take inspiration from the Great Gatsby and create that flapper party look with inspirational light fittings. Lights inspired by cocktail parties, such as the Gatsby pendant cluster light are perfect for recreating the golden age of the twenties. The fifties were a happy and exuberant time, and interior design reflected that. Known as the age of the consumer, this post war era brought about many changes in the home. Interiors were filled with new designs and new products that had a stylish and modern look. Rounded shapes and kitsch designs were popular in the home and now reflect this era of design. Shiny polished chrome was often used in furniture and light fittings for a contemporary look. Pastel shades and bright ‘bubblegum’ colours were very popular during this era and are perfect for adding a touch of retro 1950’s styling to your home. The kitchen is a perfect setting for 1950’s design. Recreate the look of old fifties American style diners with polished chrome, bright colours and retro shaped light fittings. Give your kitchen a retro fifties diner makeover with a glass pendant light such as the Elio blue glass pendant light or a metal diner-style pendant light such as the cream rise and fall ceiling pendant. The 1960’s was an era of love, pop art and flower power. Interior design embraced bright colours and fun, psychedelic patterns. New man-made materials such as plastic had recently been introduced and so became popular in furniture and home decor. This retro-modern style is still popular today and easy to recreate in your home. To embrace the sixties design in lighting, look for rounded shapes, bold colours and synthetic materials such as acrylic. A sixties style light fitting will give your home a subtle retro vibe without looking like you’ve stepped into a time warp. The Replica Circa 1949 ceiling light features bright red discs for a colourful 1960’s inspired look. 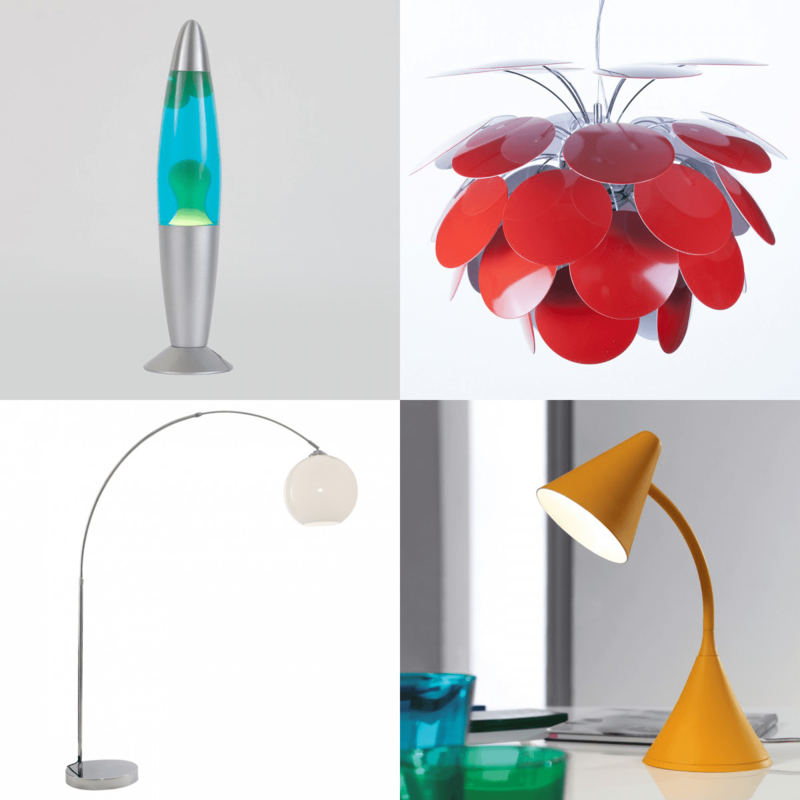 For a quick and simple solution, add quirky retro details such as a mesmerising lava lamp. Vintage style lighting is a great way to add an interesting feature to your home. Whatever your style, there is a retro look to fit perfectly with your decor. Litecraft have a wide range of vintage-inspired lighting online, including our Replica Circa vintage-style range. View our full range of lighting online here.